The U.S. Mint in 2020 will release commemorative coins celebrating the the 60th anniversary of the Naismith Memorial Basketball Hall of Fame. 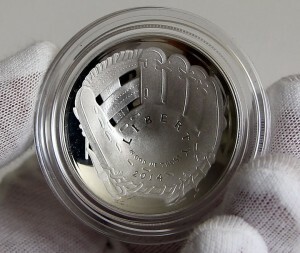 They will be curved in shape, similar to the 2014 Baseball coins with one of them shown above. Authorized under Public Law 115-343, the 2020 Naismith Memorial Basketball Hall of Fame Commemorative Coins will minted in denominations of $5, $1, and 50c with corresponding compositions of gold, silver and regular clad like those in circulation. On Dec. 21, 1891, James Naismith introduced the game of "basket ball" to his physical education class. In 1959, the Naismith Memorial Basketball Hall of Fame was dedicated to Naismith and founded in Springfield, Massachusetts, "The Birthplace of Basketball." 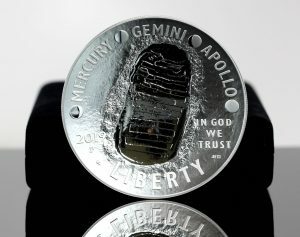 A CoinNews photo of the obverse of a 2019-P Proof Apollo 11 50th Anniversary Five Ounce Silver Dollar. The 2020 Basketball coins will feature a similar domed shape. The Basketball coins will share the same obverse (heads side) and reverse (tails side) designs. Their curved shape will be similar to the baseball coins issued in 2014 and the Apollo 11 coins released earlier this year. Each coin’s reverse will depict a basketball, as mandated by Congress. This reverse design will be developed by the U.S. Mint and is not part of the competition. As for the common imagery to appear on coin obverses, artists who enter the public competition must submit designs that are emblematic of the game of basketball. The competition has two phases. The first phase opened Tuesday, March 19, and lasts through April 15. During this time, artists age 18 and older are asked to submit digital portfolios of their prior work. Three to five examples are required. Following a review of qualified applications by an expert panel, up to 25 entries will be selected to participate in the competition’s second phase. In this phase, artists will be paid a stipend of $1,000 to submit a two-dimensional digital design for review and possible selection. The Citizens Coinage Advisory Committee (CCAC) and the U.S. Commission of Fine Arts (CFA) will review the submitted designs. After consulting with the Naismith Memorial Basketball Hall of Fame and receiving recommendations from the CCAC and the CFA, the Secretary of the Treasury will select the final design. 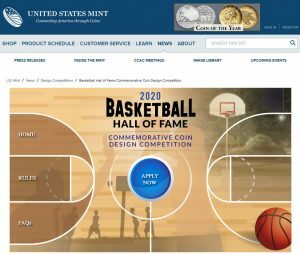 For more information, official rules and FAQ’s, the United States Mint has a webpage devoted to the design competition. Surcharges for the 2020 commemorative coins are authorized to be paid to the Naismith Memorial Basketball Hall of Fame (www.hoophall.com) to fund an endowment that will enable increased operations and educational programming. Is there a second commemorative coin for 2020, or did all of the proposals die in committee? I am glad to see a multi-billion dollar company – the NBA – is getting the proceeds to fund the tribute to themselves. I agree!!! Count me out!!!! i will not be purchasing one of these. 750,000 CLAD, they must b smoking crack when they set the limit, will maybe be worty 50c i the future… 750k really, why not 4M?? ?